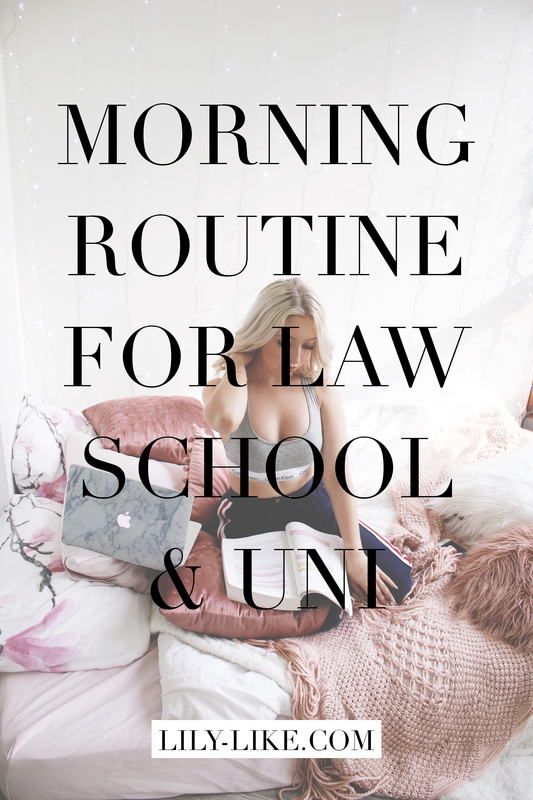 After showing you guys my updated After School Night Time Routine for US Law School/University, I also wanted to share with you my daily routine when it comes to my mornings in university. It can be quite hard to wake up early (especially during those long night study sessions you had the day before), but it is not impossible! In this blogpost I want to share with you 5 tips to create an effective morning routine. You don't have to be born as a morning person in order to be productive during your mornings! If you want to get a better, more in-depth look at my everyday morning routine for US law school/university, definitely check out my new morning routine video. It took me a while to really create a morning routine for myself that suited my new lifestyle in the US. Life here is quite different for me than in the Netherlands, so I had to adjust my everyday routine in order to fit my new lifestyle. I know my routine videos are always very popular, so if you have some minutes to spare, this video is a must watch! Furthermore, you will find my 5 tips for any successful morning routine. Well, I guess no one saw that one coming. Waking up early is so important in order to have a productive morning routine, but it is not easy. Even though snoozing in bed for those couple more minutes seems very tempting, I promise you: you will regret it. In the end, it will only make you feel more sleepy, tired & poorly rested - not the way you want to start your morning routine! Instead, try to slowly wake up a bit earlier every new morning. Even if it's just 5 minutes! This way, you can train your body to naturally wake up way earlier in the morning. I like to wake up between 6:30 and 7:30 AM, but I honestly want to try to stretch this to even earlier if possible. I definitely don't consider myself a morning person, but I LOVE the fact that if you wake up early, you have so much more time left of your day. It feels great whenever you already did a bit of reading or summarizing before it is even 9 AM. That is why I highly recommend waking up early - if I can do it, you can do it too! I know, I know. You thought you only snoozed for 5 minutes, and then you realize you woke up too late. You try to remember what day it is, and then you remember that it is your cold call day today, and you haven't prepped yet for your classes. When you crawl out of your bed and look at your reflection, you notice that you just got a visit from Mr. Pimple on your forehead too. Great. The last thing you probably would be worrying about is making yourself some healthy breakfast. I am not gonna lie, more often than not have I been guilty of the same thing - spending all my time in the morning on prepping for my lectures, doing a quick make-up & running out of the door (as I am always late). However, skipping breakfast is bad, and you shouldn't do that to your body. You will have a way better morning, and a more productive day if you do take some time out of your mornings to eat breakfast. I love making myself a green breakfast smoothie if I'm on a rush. I can just put it in a mason jar and drink it during my first lecture of that day. If I have more time, I like to make myself some avocado toast with eggs. As a bonus, I also love to drink lemon or lime infused water during my mornings to give myself that hydration boost. This may seem a bit unrealistic - giving yourself some me-time during those hectic weekday mornings, what?! - but I strongly feel that if you really nail your morning routine, you will have time to incorporate some me-time, or rather a me-moment, in it. I strongly believe in the power of self-care in order to make yourself feel and do better. It doesn't have to take you a lot of time, because even a couple of minutes can be very effective to get your day started with a positive and uplifting mindset. Think about writing a short entry in your diary, or taking the time to put on your favorite lipstick. It's these little things that can really make you feel empowered and in control. To me, that's what a me-moment, and even a successful morning routine in general, is all about. Any successful morning routine will start with some time dedicated to creating a plan or schedule. I am a big believer in the power of planning, because setting goals for yourself is the first step to actually achieving them. I love incorporating some time during my morning routine create a realistic, yet productive schedule. The planner that I have been using for 3 years now is the Supplied by Lily Student Desk Planner. Not only do these planners look very aesthetically pleasing, they are also super practical. It's perfect to organize my study tasks for the day and the rest of the week. Sneaking in some study time during the mornings can be difficult, especially if you feel extremely tired from the (study) night before. However, it's better to spend at least some time studying and reviewing your materials than completely relying on your knowledge from the day before. Even if it's only 15 minutes - it's better to have looked over your material at least once before the lecture than none. You don't wanna know how often my short term memory has saved me! I like to keep my books next to me in bed (living that forever single life lol), so I don't even have to get out of bed to read the study materials for that day. P.S. Love routines? Check out my After School Night Time Routine for US Law School/University as wel! Great thanks for sharing this useful post with us. Your all 5 tips for morning routine is really very effective for us. Definitely your morning routine video is useful for me. Weer zo’ n leuke video, zoals altijd! Ik vind jou zo inspirerend, ik droom er zelf al jaren van om de VS vaker te bezoeken of er even te wonen. Maar ik denk dat Londen iets haalbaarder is voor mijn toekomstige beroep. Lilia, love that you’ve included me-time.I think this is so important and something most people forget because everybody’s in a rush. Some time for yourself sets the day off right. Your Blog is amazing. I also love your Youtube Channel. It’s always so pleasant to listen to your voice! As to the morning routine, I think it’s essential to start your day properly. In this case, you’ll be productive and in good humor. I love the cover of your computer.